Did that actually happen? Twenty-four-and-a-bit hours after one of the greatest sporting comebacks ever seen it is maybe a daft question, but it feels like one that needs to be asked. I mean, I was there, but as I sit here cruising at 37,000ft above the Atlantic, I'm not sure. Fresh in my mind is the sight on Saturday of the scoreboards around the Medinah Country Club: USA 10-4 EUR. At that stage even Moses would have struggled against the sea of red that was washing over the Europeans. But, yes, it did happen. Yes, Ian Poulter did drag Europe back into it with a superhuman display. Yes, Paul Lawrie utterly outclassed Brandt Snedeker, the form man of the United States team, who the week before was picking up a $10m pay cheque. 'Medinah, Chicago' are now bywords for sporting heroics, drama and excitement. What will 'Gleneagles 2014' stand for? And yes, an ocean of champagne was criminally wasted in scenes of pure exhilaration. I should know; Luke Donald soaked me and the other media guys who were standing behind him on the players' bridge at the first. He soaked me, and my new Ryder Cup polo shirt, which Mrs Goodlad is going to dislike even more when the credit card bill crashes through the letterbox. But the best thing - it's all coming to Scotland in two years' time. It seems such a long time since Gleneagles first bid, back in 2001, to host golf's biennial transatlantic clash. It was a time of uncertainty for the Ryder Cup and not just because of the terrorist attacks of September 11th that caused that year's match to be postponed. Brookline 1999 and those US celebrations on the 17th green left such a bad taste in the mouth that some feared for the very future of the Ryder Cup. But the last decade has seen it flourish. 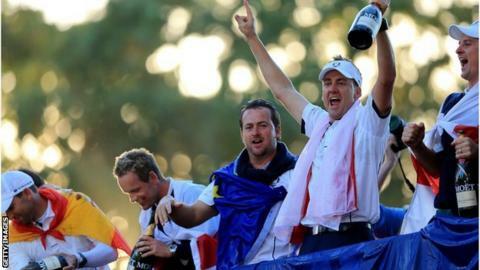 Stories like Darren Clarke's performance at the K Club in 2006 just weeks after his wife had died of cancer, the rain and historic Monday finish at Celtic Manor two years ago and, of course, this year's European heroics, have helped boost the Ryder Cup "brand". And despite all of us being awe-struck by events on the course at Medinah, it's the riches off it that are behind the move to bring the Ryder Cup back to Scotland. The Scottish government, led at Medinah by the tartan-trouser clad First Minister Alex Salmond, says Gleneagles 2014 will be worth £100m to the economy. It also provides the type of sponsorship money can't buy. "Medinah, Chicago" are now bywords for sporting heroics, drama and excitement. What will "Gleneagles 2014" stand for? On the course, what are the chances of cheering on a home favourite at Gleneagles? Paul Lawrie was outstanding in Sunday's singles and is a player re-born this season. He'll be 45 in two years' time, but if he can maintain his current form age will be no barrier. But I wonder if we won't see the Aberdonian in a more senior role. Clarke has already said this season that he thinks Lawrie would make an excellent captain for 2014. Others though, including Clarke, are surely ahead of him in the queue. But a vice-captain position, playing or not, is a very strong possibility. Martin Laird, Ritchie Ramsay and Stephen Gallacher will lead a group of Scottish players who will be desparate to play in front of home galleries. And the example of Nicolas Colsaerts gives hope to the rest. The Belgian was outside the world's top 1,000 just three years ago. Now he's a Ryder Cup winner. Gleneagles 2014 seems a lifetime away. But then so does the moment on Saturday when I looked up at the huge scoreboards around Medinah and saw USA 10-4 EUR scream out. Yes, it did happen, Europe did mount one of the greatest comebacks in sport and I have the champagne-splattered polo to prove it. If Gleneagles is half as good, then Scotland and the watching world is in for a treat. You can follow Phil Goodlad on Twitter.